Find out what has sent these winners higher and whether they have more room to run. Freeport's Chino mining site. Image source: Freeport-McMoRan. The stock market remains near all-time record levels, but many investors aren't satisfied with the market's overall gains. So far this year, the S&P 500 has produced total returns of only about 8%. 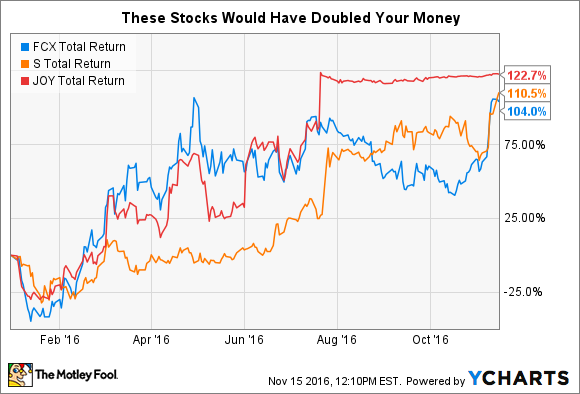 But if you're looking for really strong returns, there are some individual stocks that would have doubled your money if you'd bought them at the beginning of 2016. Below, we'll take a closer look at Freeport-McMoRan (NYSE:FCX), Sprint (NYSE:S), and Joy Global (NYSE:JOY) to see if there's any potential left for new investors in these stocks. FCX Total Return Price data by YCharts. Freeport-McMoRan took big hits over the past few years because of big declines in its key commodity markets. Its acquisition of two oil and gas exploration and production companies came at the exact wrong time, with crude prices plunging shortly after the purchase. At the same time, copper and gold prices also suffered. The combination forced Freeport to take painful impairment charges and sent the stock plunging. Yet so far in 2016, Freeport has gotten some relief. Energy prices have stabilized and risen somewhat, and although prices haven't come close to regaining their prior levels, Freeport nevertheless has been able to see an end to future impairment charges. At the same time, copper prices have soared, climbing by 25% since the beginning of the year and hitting the $2.50 per-pound mark for the first time since mid-2015. But Freeport's efforts to contain expenses have worked well, and efforts to preserve capital and sell off noncore assets on both the mining and energy sides of the business have paid off well. If commodities keep performing well, Freeport has further to run. Sprint has also recovered from big losses in 2014 and 2015, more than doubling so far in 2016. The declines came in large part due to competitive pressures in the U.S. wireless industry. With major carriers continuing to claim massive amounts of market share and with rival T-Mobile poaching customers from the rest of the industry, Sprint was in danger of being an also-ran in the business. Moreover, ongoing speculation that Sprint would get bought out has never panned out, discouraging shareholders who hoped for an M&A exit to their positions. This year, though, Sprint has started to show signs of success. Quarterly results have started to improve, with stronger revenue, narrower losses, and lower churn rates than Sprint has historically managed. Company executives are optimistic about Sprint's future, providing guidance that could produce further gains. Still, with a vulnerable balance sheet laden with debt, Sprint will have a lot of obstacles to overcome in the future to sustain and add to its share-price gains. Joy Global was another victim of the commodities crunch, because its focus on mining-equipment manufacturing left it in a terrible position when its mining-company clients no longer had the cash to purchase replacement equipment. Share prices plunged as investors realized that Joy Global would have to wait until the next upward cycle in commodities prices to expect a recovery. Yet good news came earlier than expected, when Japanese conglomerate Komatsu said in July that it would purchase Joy Global. The company offered $3.7 billion, working out to $28.30 per share, in cash for Joy Global. For a stock that had fallen below $9 per share in January, the news was extraordinary. Even after shares had seen strong gains in light of the recovery in commodities, Joy Global's acquisition bid came with a roughly 30% premium to its market price before the announcement. Joy Global stock trades within pennies of its proposed acquisition price, so it's unlikely that investors will get any further appreciation from the stock. Indeed, the risk of a decline exists if Komatsu decides not to pursue the acquisition for some reason, but most still expect the deal to close sometime in the first half of 2017. You won't find many stocks that double within less than a year, and investors can't expect equally strong performance from these stocks going forward. Yet among these picks, Freeport-McMoRan has the best prospects for future gains, if the energy and mining markets continue to improve going forward.